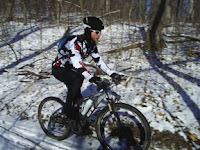 Distance: Two 20 mile loops. Do one or both. 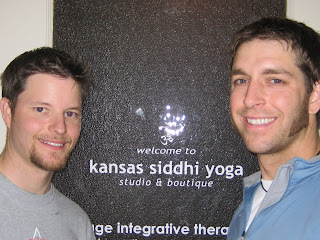 Rich Anderson and I made the trip down to kansas siddhi yoga, one of our new sponsors for the 2008 season. Rich has done several classes but this was my first. The 1.5 hour session was great for stretching and can also be a good strength workout, it is also very relaxing. My girlfriend joined me and Rich's wife, Mary, is shadowing the classes. Jenn and I decided to sign up for a 5 session pass and we plan on making this a weekly outing at least until she leaves for work in March. The stretching part of the regimen is only a small part of the yoga experience as Gina, our instructor pointed out during the session, but it was the part that I felt the most that night. Later in the evening as I went to bed I was amazed at how relaxed my neck and back were, I hope to make this a regular part of my training for a long time to come and I recommend it to everyone. Check them out at www.moyoga.com. The 2008 schedule HERE! 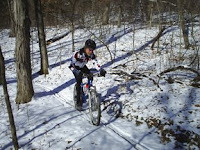 There will be 7 cross country races and a six hour event. The six hour event will not be a points paying race. 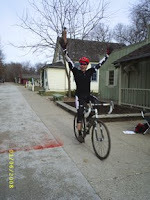 August 30 (SATURDAY) Tall Oak Challenge - 6 Hour - Binder Lake**this is not a points race. 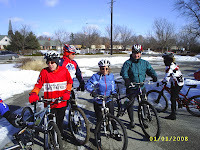 This weekend a few of us got together on Saturday and Sunday mornings for some LSD (long slow distance). 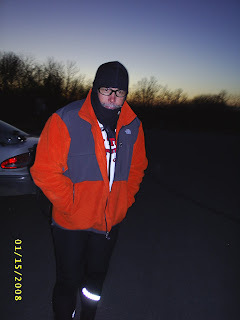 Chris Locke, Randy Cartwright and Dan Grier met up early Saturday morning with light snow still covering the roads. 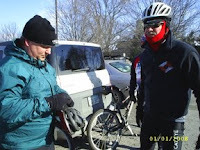 Chris and Dan ended up with 40 miles, while I (Randy) accidentally ended up with almost 60 (Darn gmap-pedometer.com underestimated my route by about 13 miles). 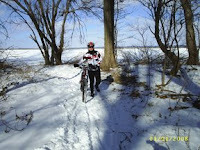 We rode a route around Smithville Lake then back to the Northland. 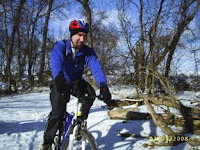 Sunday Richard Anderson, Ashley Blum and Randy met up at Ashley's house in Independence for a good 3 hour ride. 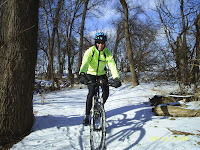 The route was great for active recovery as well as base miles, predominately flat and following the Missouri River eastward from Independence. I really like the ride and the best part was that Ashley's wife Dana had made a great "brunch for a bunch" for us when we returned. 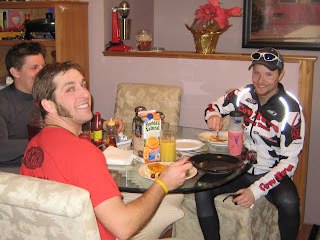 We will have to definately do that route again, if for no other reason than the meal at the end, Thanks Dana. Us enjoying Dana's great brunch. Today's Caner-thon held in Leavenworth Kansas was a great success. 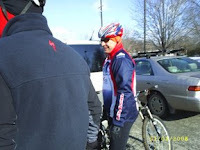 Brendan from Santa Fe Trails Bicycle and Coffee Shop together with Roger put on a very fun event and raised money for the American Cancer Fund. 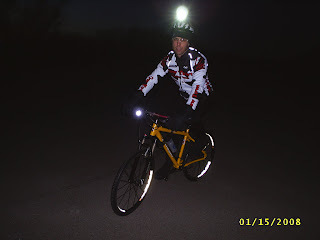 Check out Roger's photos - Caner-thon photos. 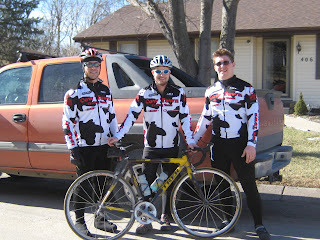 Congratulations to Cow Town Cycling members Damian Almanza, Carolynn Locke, Christopher Locke and Chris Locke. 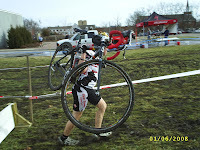 Together they won the Team Division during the 2007 Midwest Fat Tire Championship series. 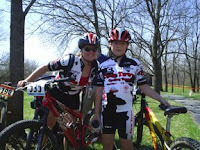 Individual titles were also won by Carolynn Locke (Beginner Women) and Christopher Locke (Kids 8 - 12). 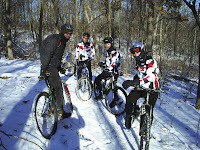 Several of us met on Sunday to ride the trails at Clinton Lake in Lawrence, KS. 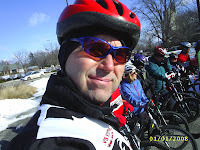 Six of us total made the ride, Chris Locke, Shad Schreiner, Jeff Arnaud, Gerard Arantowicz, Mark Studnicki and Randy Cartwright. 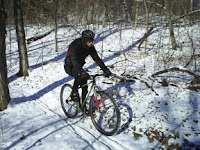 The conditions were a little worse than at Landahl most likely due to the deeper snow and not as many riders had packed it down. We ended up with about 2.5 hours of riding. 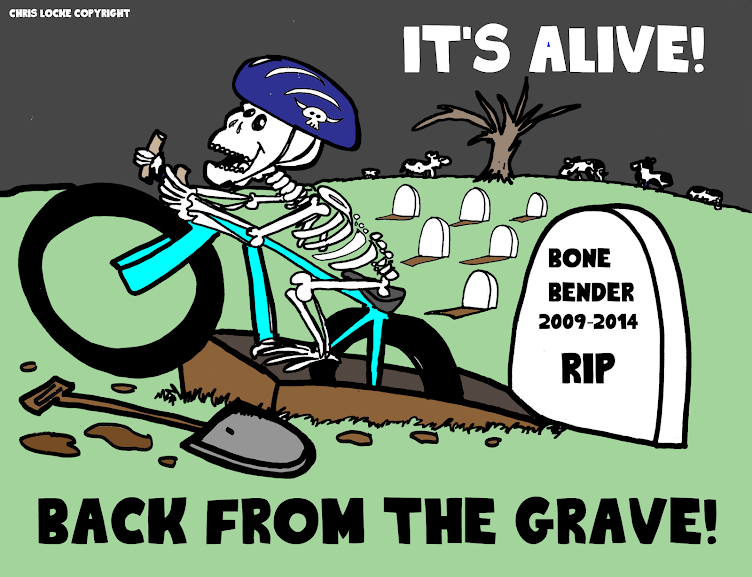 Shad had several mechanicals, two flats and a broken chain. 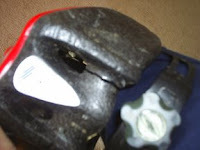 Chris kept the wheels down and saved his head from another smack on the rocks. 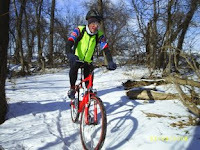 Gerard had a tough time on the snowy conditions with the single speed. 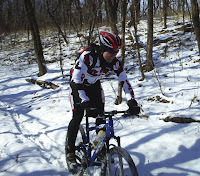 A good base building workout on the frozen trails ! Participants: Shad, Randy, Rich, Eric and Chris. 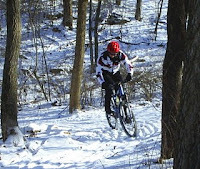 Course conditions: Most of the trails were packed and traction was good for the most part. Number of crashes: At least 5, but who is counting. 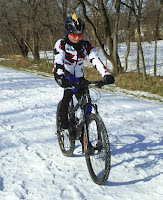 Pace: Slow enough to ride ~ 3hours, but fast enough to stay warm. 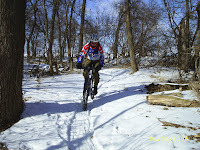 Sunday we are meeting at Clinton Lake for another fun ride in the snow. 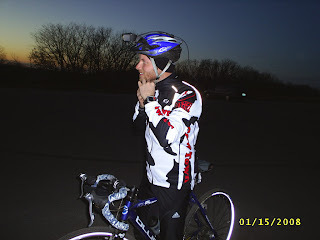 Randy readies himself as the sun sets. John thinking "why am I out here in when it is 25 degrees, windy and dark as all get out..."
Locke just happy to be away from work for a few hours. 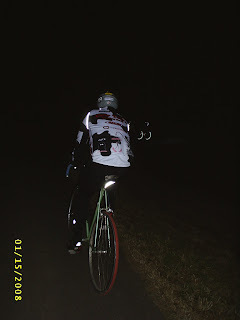 Harter cruising on his fixed gear just past the Bonebender trail head. 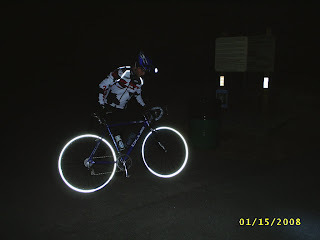 Cartwright glowing in the dark. 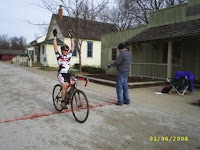 Congratulations to Christopher Locke and Chris Locke for winning their respective classes in the De Stad Cyclocross Van Kansas Series. 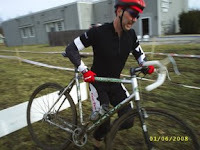 Christopher made it 5 wins in a row to win the Junior title while his dad had a harder time of it finishing 4th at today's Grote Prijs to take the series Single Speed title. In the Men's 3/4 class, a sleep deprived Damian Almanza placed 8th. 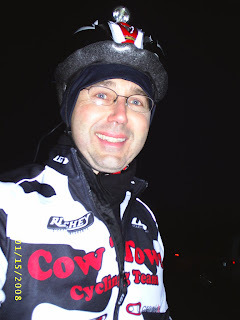 The Cow Town Cycling Team was well represented at today's annual Lawrence Mountain Bike Club New Years Day Ride. Held since 1996, this ride starts off each new year no matter what the weather. 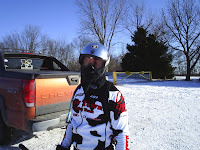 This year the temperatures were in the 20's with gusting winds around 20+ mph making it a cold day in the saddle. 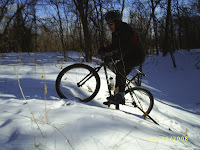 Trail conditions were varied between great to icy to 2 foot snow drifts. 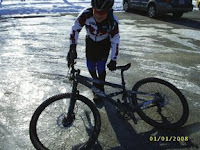 A few crashes were had by all, some even before they left the parking lot (Christopher you know who I am talking about). 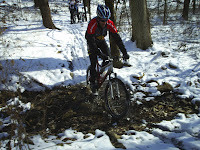 Tige even took a nice header over the bars when he tried to ride through a snow drift. 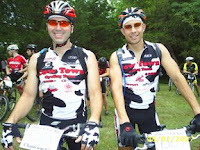 Alway a great ride for sure, this year's event is another one to be remembered.